By 1955 Jackie Robinson had become a baseball superstar, the very face of the Brooklyn Dodgers organization. His action-packed style of play had rubbed off on his teammates, and those Dodgers clubs of the 1950’s were every inch a reflection of Robinson’s play. Besides being the man who successfully shattered baseball’s color line, as Jackie turned 36 in 1955, he could look back on a career highlighted by the game’s greatest awards: Rookie of the Year (1947), National League Most Valuable Player (1949), Batting Champion (1949), two-time stolen base champ (1947 and 1949) and six All-Star appearances. He was also the fire and drive behind Brooklyn’s five National League pennants – yet one thing eluded Jackie Robinson – a World Championship. That would change in 1955. The Dodgers that year was a perfect combination of veterans and youth. That year’s MVP, Roy Campanella, called the shots for a pitching staff consisting of vets Don Newcombe and Carl Erskine backed up by newcomers Don Drysdale, Johnny Podres and Sandy Koufax. Old-timers Snider and Furillo still roamed the outfield, backed up by a young, fleet-footed Cuban, Sandy Amoros. Gil Hodges and Pee Wee Reese added stability in the infield while Junior Gilliam was being groomed to take Jackie Robinson’s place at second. Jackie was moved over to third, completing one of the strongest clubs to ever wear Dodger Blue and Brooklyn cruised to the pennant by 13 ½ games over Milwaukee. Their opponent in the World Series was their old nemesis, the New York Yankees. Since Robinson came up to Brooklyn in 1947, the Dodgers faced the Yanks four times, and each hard-fought Series ended in a traumatic Dodger defeat. To a competitor as ferocious as Jackie Robinson, this was unacceptable, and 1955 would be different. 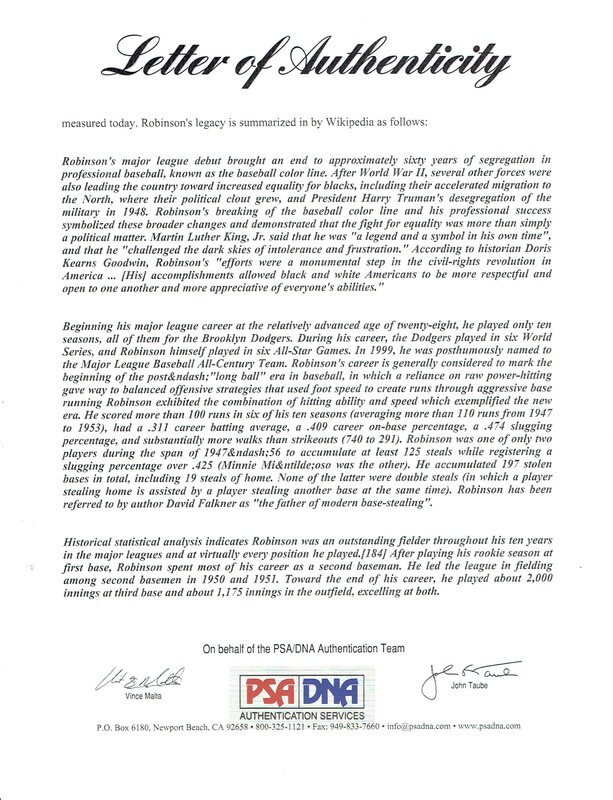 From the start it became apparent that the Dodgers were not going to roll over, and the proof of that were Robinson’s actions in the first game. He began by hitting a triple off Whitey Ford in the second inning, then scoring on Don Zimmer’s single. The Yanks were ahead 6-3 when Robinson reached second on an error in the top of the 8th. Zimmer sacrificed in a run to make it 6-4. Robinson danced off third as the Yankee Stadium crowd held its breath. Then, Jackie took off, barreling down the base path like a man 15 years younger than his 36 years. An incredulous Yogi Berra waited at the plate, and in one of the most hotly contested moments in World Series history, Robinson evaded the tag to score. The footage of the moment has become one of those iconic moments in sports, with a screaming Yogi Berra arguing the call, and Robinson calmly and triumphantly getting up and trotting to the dugout. Despite Robinson’s mad dash, the Yankees took Game 1, but the example set by the team’s aging third baseman spurred this Dodger team on to do what they had failed to do before – win the World Championship. The 1955 Series was Jackie’s swan song. The following year would be his last, his World Championship the final laurel of a career that took him all the way to Cooperstown. This stunning Hillerich & Bradsby bat was used by Jackie Robinson in the 1955 World Series. As is still the custom today, Hillerich & Bradsby created custom bats for the participants in the Fall Classic. 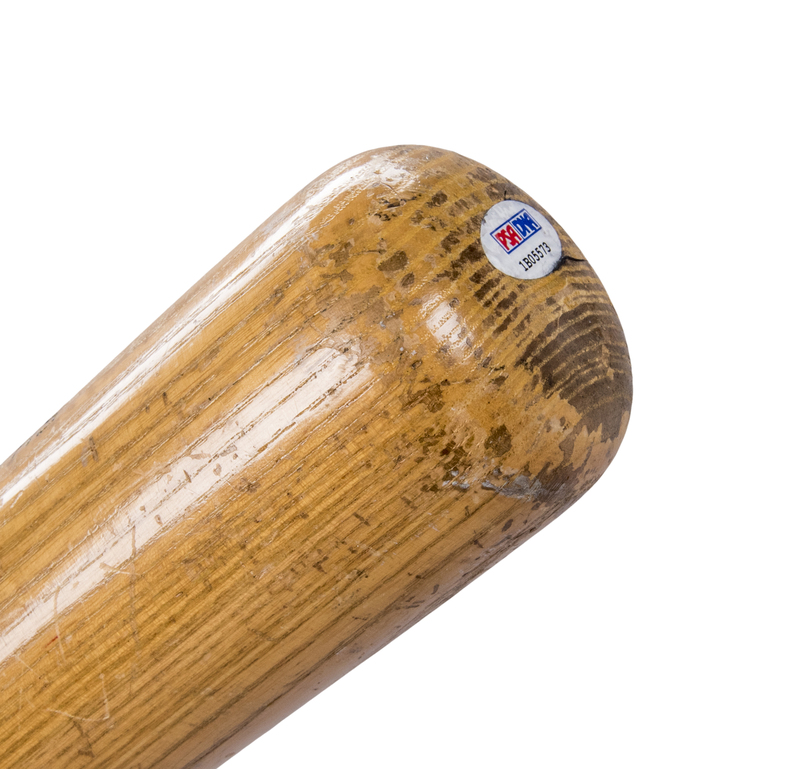 Made to the exact specifications as the player’s regular season bats, these World Series models were distinguished by the stamping underneath the faux signature on the barrel – in this case “1955 WORLD SERIES” and “BROOKLYN DODGERS”. 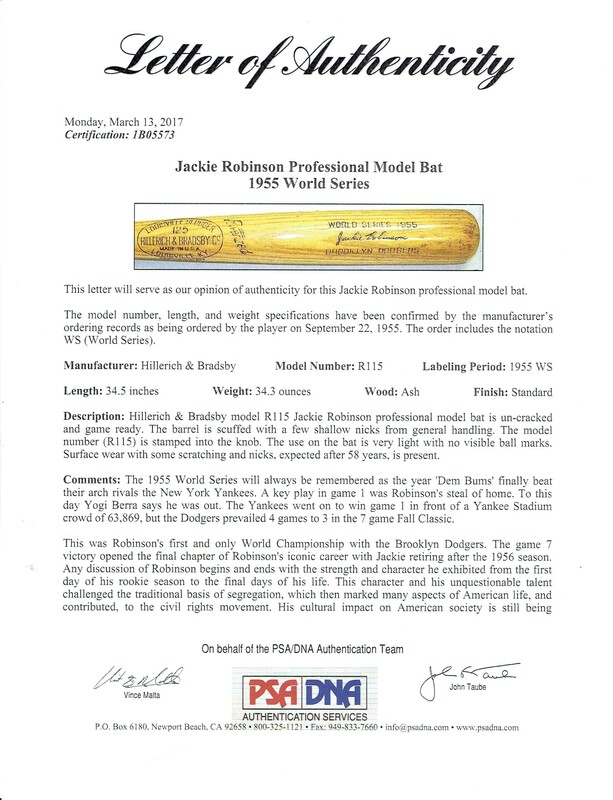 Jackie’s World Series bat is a model R115, 34.5 inches long and weighting 34.3 ounces. Those specs match the existing factory records in Louisville and correspond to an order placed by Jackie on September 22, 1955. Over six decades later, the bat is still un-cracked and shows light but definite game use. 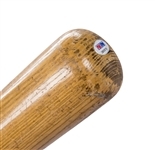 On the area above the barrel and to the right of the word “DODGERS”, are two cleat-like marks and an area showing abrasions and contact marks, consistent with game use during the World Series. 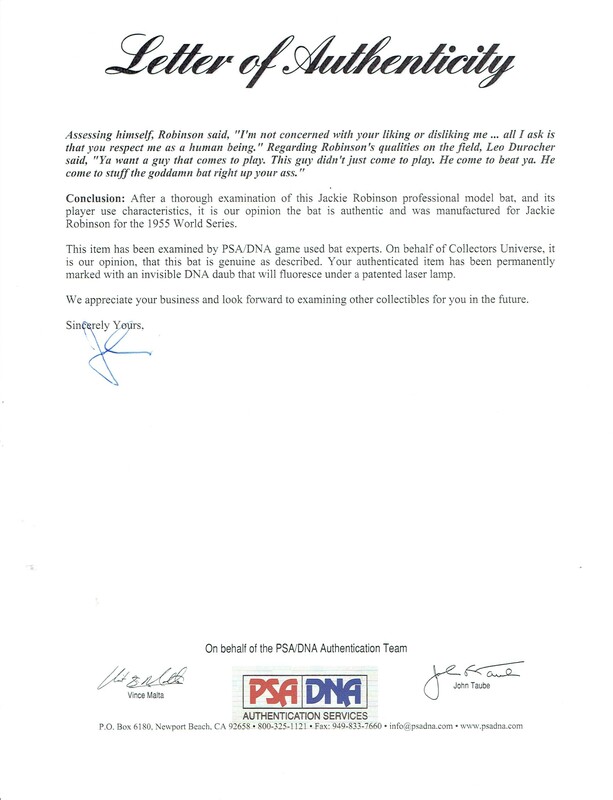 There are precious few game used bats attributed to Jackie Robinson, and every one that has survived is a cherished piece of baseball history. 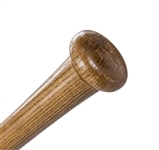 However, this bat, being the only bat known used by Jackie in his (and Brooklyn’s) only World Championship, puts it in a category all its own. 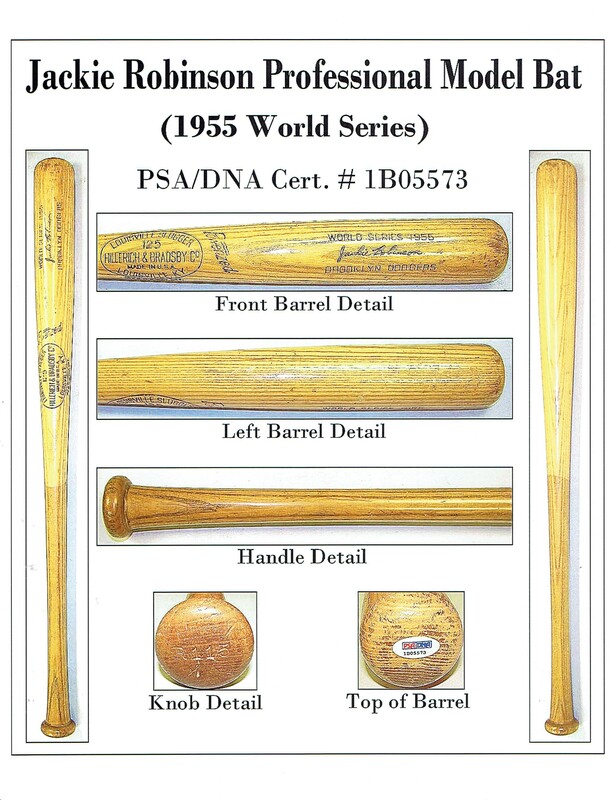 This is a true baseball artifact from one of the greatest Word Series of all-time, used by one of the greatest men to ever play the game and it comes with a full LOA from PSA/DNA (1B05573) and a LOA from Mears, who has graded this bat an A9. Auction closed on Sunday, April 30, 2017.